Matt Olson returned home Wednesday 199 days after the injury that left him paralyzed below his shoulders. The onetime Totino-Grace standout hockey player suffered a severe injury to his neck and spinal cord in February after falling headfirst into the boards during a junior league hockey game in Chicago. Olson has spent the last seven months in three different cities receiving care and undergoing rehab. Now the 20-year-old can rest and start a new routine in the comfort of his own home in Isanti. Olson was undergoing therapy at the Courage Kenny Rehabilitation Institute in Golden Valley since mid-June and will continue to receive out-patient therapy at the facility. 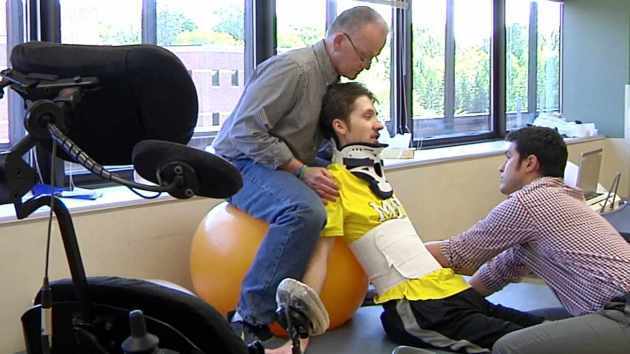 Olson underwent surgery and received experimental stem cell therapy in the month after his injury, and in April relocated to the Mayo Clinic in Rochester for a spinal cord injury rehabilitation program. The Mayo Clinic explained Olson had broken bones in his neck and the spinal cord was pinched at the C-4 level, leaving him paralyzed below the shoulders, though he has some feeling in his biceps and forearm. “It’s going to take time,” Olson said during his therapy at the Mayo Clinic. “It’s a slow process. I know that I’m going to get better. I just keep working on different things in therapy. Dr. Ronald Reeves, a spinal cord injury specialist at the Mayo Clinic, said Olson has done a very good job making progress and learning to direct his care. Dr. Reeves added that Olson's experience as an athlete and awareness of his body likely provided a strong foundation to do well so quickly. Photo courtesy of Mayo Clinic.